For many Palestinian families, the most important part of their kitchen is what is called the supply cabinet or supply pantry, which contains different foods preserved naturally to be used throughout the year. In a basic one, you can find a variety of options such as salted white cheese, strained yogurt balls (labaneh), olive oil, pickled olives and veggies, grains, jams, molasses, and dried herbs. It is resupplied constantly from season to season, mostly during Spring and Fall. Fall is the season where there is plenty of activity as sumac, carob, pomegranate are picked. 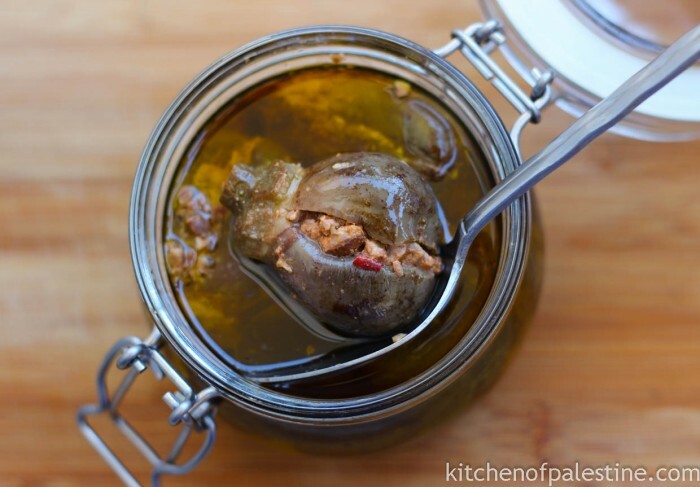 Tons of olives are harvested and mostly made into olive oil, while some of it is used to make olive pickles. 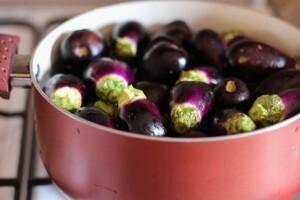 Also it’s the season of vegetables that are main ingredients of many Palestinian dishes, one example is eggplant. I was driving from Amman to Jerash two weeks ago, all I could see by the side of the road were street vendors with boxes and boxes of baby eggplants on display, and this only means one thing, it is time to make Makdous! 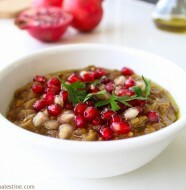 Makdous is a light meal and is usually eaten at breakfast as part of a spread of different foods such as labaneh, tomatoes, green leaves with cup of tea. 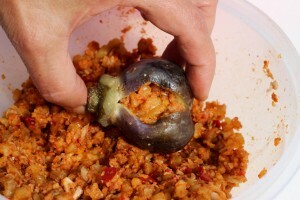 It is prepared by stuffing the baby eggplants with walnuts, red chilies, garlic and preserved in lots of olive oil and stacking them in a jar for a period of 10-14 days, giving it a uniquely strong taste. I really enjoy the taste of the oil after it has been used with the makdous, as it becomes enriched with all the different flavors. The name Makdous comes from the Arabic verb ‘Kadasa’ which means to stack! 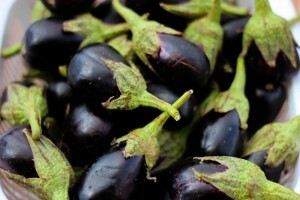 Wash the eggplants thoroughly and cut off their stems using a sharp knife, keeping the base of stems as in the picture. (this cutting style is preferable but not necessary, it will keep and hold the shape of eggplants after cooking and pickling). Put the eggplants in a large pot and add water to cover them, bring them to a boil. after boiling, leave them for 10 to 15 minutes and make sure to cover them and flip them from time to time. It's very important to know when to stop cooking; they should be a little bit soft but not very tender.Place the eggplants in a colander to drain. For stuffing, mix walnuts, garlic, red chili and some salt. Make a slit in one side of each eggplant using your thumbs. Dip your index in a small plate of salt and apply it inside each eggplant. Stuff eggplants with the mixture. 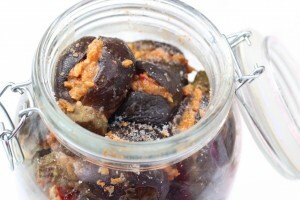 Arrange eggplants in a big jar, adding salt over every single layer of arranged eggplants. Flip the jar upside-down in a colander to drain water for 24 hours. 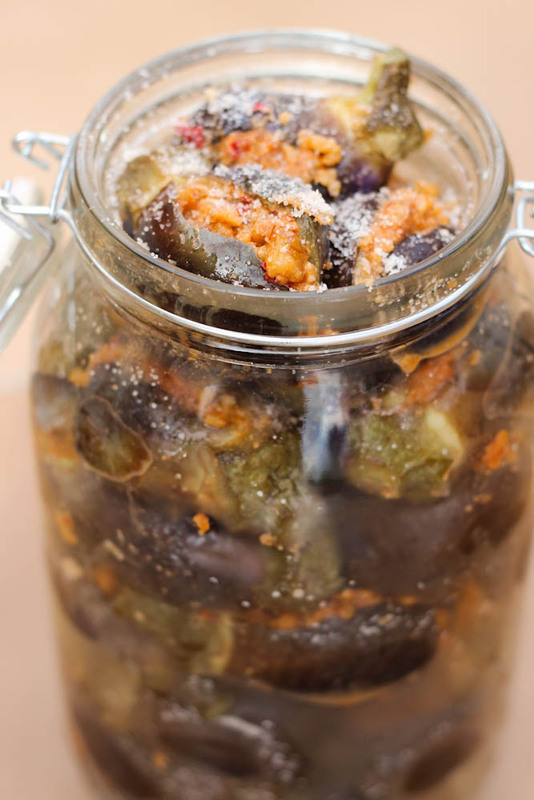 After one day, fill the jar with olive oil covering eggplants and keep it in a kitchen temperature. It needs from 10 to 14 to be ready. 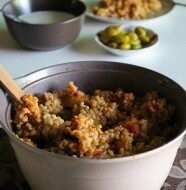 Enjoy it on breakfast with labaneh, rocca and cup of tea! 9 Comments on "Pickled Stuffed Eggplants (Makdous)"
10 to 14 days right? Just tasted mine and the texture is good but it’s not sour and a bit bitter how do o fix it? Did you ever figure out how to fix it? Mine are not sour either. If not sour, it needs more time. If bitter, its good to slit egplants and salt slit. Put in strainer and weigh down to let bitter liquids drain overnight before stuffing. 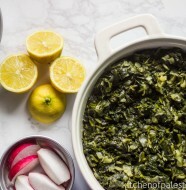 Amazingly similar recipe to my grandma’s. Thank you for this lovely page!